As the Final Fantasy series is seeing more games get released on the Nintendo Switch, it was only a matter of time before Final Fantasy X and X-2 finally appear on a Nintendo console. 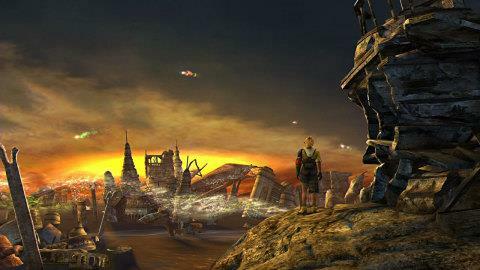 Final Fantasy X/X-2 HD Remaster will be hitting the Nintendo Switch next Tuesday April 16th. Nintendo players can now immerse themselves in the World of Spira and enjoy more than one hundred combined hours of gameplay across both titles...and Blitzball. Don't forget about Blitzball. I mean, it's only the most important part of the game. Fans of Mortal Kombat are now able to pre-purchase Mortal Kombat 11 on the Nintendo Switch. This will be the series' first game on a Nintendo system since 2007's Ultimate Mortal Kombat on the Nintendo DS and Mortal Kombat Armageddon on the Nintendo Wii. While I was never a huge fan of the series, it is nice to see it return to a Nintendo platform. Other upcoming releases include Hellblade: Senua's Sacrifice which released on the Switch today, as well as My Time at Portia which launches next Tuesday April 16th. If you're a fan of Tetris 99, the Second MAXIMUS Cup begins tomorrow (April 12th) at 6 a.m. PT and runs through April 14th at 11:59 p.m. PT. Players will earn event points by playing matches and the better they do, the more points they earn. Every one hundred event points will count as one TETRIS MAXIMUS (seriously, that's how it's typed out in the press release) and after the event, the top 999 players with the most event points will receive 999 My Nintendo Gold Points. Read on for the official press release for more new games in the Nintendo eShop for the Switch as well as any ongoing sales. Mortal Kombat 11 – Pre-Purchase – The latest installment in the Mortal Kombat franchise. Featuring a roster of new and returning Klassic Fighters, Mortal Kombat's cinematic story mode continues the epic saga over 25 years in the making. Packed to the brim with multiple modes, including the Towers of Time, allowing players to test their skills through various challenges, providing more ways to continue the Mortal Kombat 11experience.